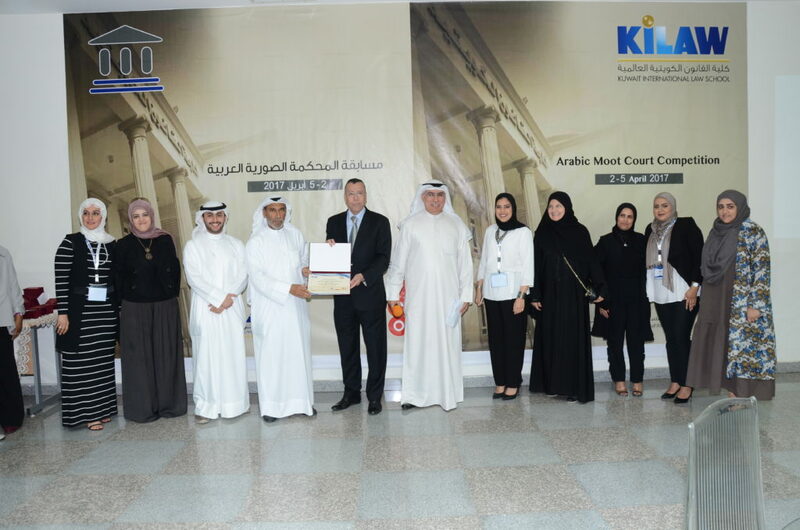 On Wednesday, April 5, 2017, Kuwait International Law School concluded the Arabic Moot Court Competition, which was hosted by Kuwait for the first time. The competition took place from April 2 to 5, and witnessed the participation of delegations from 12 Arab Law Schools, including students, judges and arbitrators. Teams competed for four days and presented their written and oral pleadings in a case related to the area of Criminal Law. The Palestinian team, representing the Faculty of Law at Birzeit University won the first prize and was followed by the Moroccan team who represented the Faculty of Law from Cadi Ayyad University (Marrakesh / the Kingdom of Morocco), while KILAW’s team came third after participating in the semi-finals followed by the team representing the Faculty of Law at Sultan Qaboos University (Oman). In addition to these teams, Teams from the following universities participated in the competition: University of Jordan, Alexandria University, Kingdom University, University of Bahrain, Qatar University, Beirut Arab University, Baghdad University, Jouf University – Saudi Arabia. The last sessions of the competition witnessed intensive efforts by the judges who conducted the sessions with professional objectivity consistent with sessions held in Arab and international courts. Members of the eliminated teams attended the final sessions in addition to KILAW’s students and faculty members in a competitive yet friendly atmosphere under the management of the School administration, which was keen to provide participating teams with all the necessary requirements, such as accommodation, mobility or catering services. The School also organized visits to Souq Al Mubarakeya and the Avenues Mall, to introduce the participating teams to two contrasting landmarks, reflecting modern and traditional aspects of Kuwait. The competition was sponsored by the Kuwaiti government. The Minister of Trade and Industry and the Acting Minister of Sports and Youth, Mr. Khalid Al-Rawdan, participated in the opening session, and gave a speech welcoming the participants in the competition, which is being held for the first time in Kuwait. He praised KILAW’s initiative and its effective contributions to embrace and encourage Kuwaiti students to obtain academic and practical skills through the advanced academic approach, academic activities, participation in Arab and international competitions. The minister took the opportunity to emphasize the government’s continued interest in Kuwaiti youth initiatives in accordance with the directives of the political leadership, which is keen to provide the necessary care for youth and help them achieve their ambitions and aspirations. For his part, KILAW’s President, Prof. Mohammad Al Moqatei expressed the School’s pride of embracing this Arabic competition, which helps Kuwaiti students excel in competitions with their peers from Arab universities in preparing memoranda and oral arguments in complex legal cases. He emphasized that participating in international and regional competitions is a strategic choice for the School administration and has proved its usefulness in developing the students’ academic and professional levels and helping them to acquire practical skills and abilities which would enhance their chances of academic attainment and compete in professional and advanced quality opportunities such as joining the judiciary or the Fatwa and Legislation Department, etc. He added that the School is keen to invest more in student and university competitions. In the same context, the Director of the Student Development and Competition Department at KILAW, Mrs. Hanaa Al-Ibrahim, stressed that the School administration is keen to implement its views in hosting and participating in international and regional competitions effectively through selecting and training students who wish to participate in competitions. Al-Ibrahim stressed the School administration’s keenness through organizing this event and other similar events to provide means of comfort for the participating students so that they can participate in competitions and strive to acquire skills and develop their academic and professional levels and therefore win prizes and achieve higher ranks. Mohammad Al-Moqatei, KILAW’s President/Dean, was keen to be present on a daily basis to follow up the smallest details to ensure the success of this event under the organization of Kuwait International Law School in hosting a large number of students and organizing the competition in a serious atmosphere which has left its mark on students who have made endless efforts and competed in a friendly and fair manner. Chairman of the Higher Committee of Judges, Dr. Faisal Al-Kandari and the members of the Committee: Dr. Abdullah Al-Rumah, Dr. Mahmoud Al-Maghrabi, Dr. Noura Al-Abd Al-Razzaq received the thanks and appreciation of the coaches of the participating teams for their neutrality, their response to all inquiries, and their adoption of academic standards in selecting the winning teams. The efforts of Mrs. Hanaa Al Ibrahim, Director of Student Development and Competition, and the staff of the Reception and Organizing Committees, have been highly appreciated by the participants as they have shown a great hospitality and provided teams with all the necessary requirements to ensure the success of this events and to enable participants to achieve the mission they came for. Sana Harrar, a student from Cadi Ayyad University, Morocco, was praised by Prof. Mohammad Al Moqatei for her outstanding performance in defending the defendants and her courage in presenting her point of view in a remarkable manner. The Reception and Organization Committee organized field trips for visiting teams to many of Kuwait’s traditional places, especially Souq Al Mubarakeya, where they got acquainted with its features and wandered among its shops that smell of Kuwait’s beautiful past. Mohammed Al-Moqatei and Mrs. Hanaa Al-Ibrahim during honoring KILAW’s team. The student Sana Harrar during her participation in the competition. Mohammad Al Moqatei honoring Dr. Faisal Al-Kandari.